Asian Fortunes is probably the most-loved slot machine Novomatic have ever made. This slot machine is found in many Novomatic casinos in many cities! Players love this slot for the big wins and people have definitely won big on this slot! There are loads of videos you can watch where the slot has gone crazy and paid out insane wins! 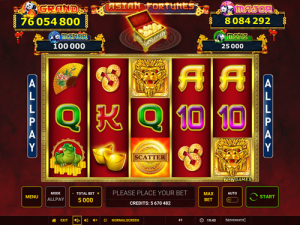 Now you can have the chance to win the Asian Fortunes jackpot online! Novomatic have recently adapted this slot for online casinos (Novomatic casino reviews here) and players are seriously enjoying it. Asian Fortunes has five reels and no paylines. Every line is a payline as this jackpot slot is an allplay slot! Novomatic aren’t known for making slots like this but, lately, they’ve started to make more allplay slots. Other game vendors, such as BTG, make more allplay slots than Novomatic. Slots made by Novomatic and Greentube tend to have 5, 10, 20 or 40 payline, which is yet another thing that makes Asian Fortunes so special! Asian Fortunes is based on an obvious theme, as you can tell by the title. There are so many lovely details on the symbols, the reels and the background, which make this slot so rich and beautiful! In addition to filling your pockets, this slot will dazzle your eyes! The main colour is a deep red and all of the detail, including the outline of the reels and the logo, is shiny gold. There’s a fortune to be won in Asian Fortunes but there’s also a fortune of symbols! The symbols really sparkle as you spin the reels, especially because of all the gold in the detail! The plainer symbols are the symbols that pay the smallest wins. 9, 10, J, Q, K and A are the card symbols in this Novomatic slot. These show up on most of their games. They’re all different colours which help you spot them more easily when you spin matches! The more elaborate symbols give the bigger payouts! The floral fan gives the smallest payouts of these illustrated symbols. Bigger wins are awarded for symbols like the golden coins and the golden dragon. Every symbol in the game awards a win for 3 matches, 4 matches and 5 matches. Because Asian Fortunes is an allplay slot, the symbols can land on any position! They pay when the first match lands on the leftmost reel and the rest follow on consecutive reels. When you’re paid a win, you can gamble it if you want. The gamble feature is a 50/50 chance game – you can double your win, but you stand as much chance at losing it! In this Novomatic jackpot slot, a golden gong is the Scatter symbol. Like all the other symbols, this also awards payouts for matches of three or more. The difference between this symbol and the other symbols is that the Scatter doesn’t have to land on consecutive reels. Three or more golden gongs in any position on any reels will pay a win! The win includes a payout plus 10 Free Spins. During the Free Spins, the Ace, King, Queen, Jack, 10 and 9 symbols are removed from the reels. This makes the Free Spins extra exciting and lucrative! No other Novomatic slot game only has the highest-paying symbols on the reels in the Free Games! There are two different Wild symbols in Asian Fortunes. There’s a red Wild symbol and a blue Wild symbol. The blue Wild symbol can only appear on the 2nd and 4th reels. The red Wild symbol can only appear on the middle reel. This red Wild symbol doubles a win when it acts as a substitute! Either Wild symbol can trigger the jackpot game. A golden coin is added to the jackpot chest at the top of the reels, every time a Wild symbol lands on the reels. When the chest is full, the jackpot game will begin! 12 golden gong symbols will appear and will fill the screen. The instructions will tell you to choose them one by one to reveal the panda underneath! 3 green pandas will award the mini jackpot. 3 blue pandas will award the minor jackpot. 3 pink pandas will award the major jackpot. Finally, 3 orange pandas will award the grand jackpot!